The Vector back brace provides targeted, vectored compression through a dual pulley cinching system. When you pull the handles, the cinching system pulls the lumbar panel forward into your spine for effortless compression to the lower spine. The lumbar panel can be adjusted left or right with the pulley handles for customized, targeted compression. The Vector's lumbar panel also includes a pocket for a hot/cold therapeutic gel pad. The gel pad, which is included with the brace, can be placed in the microwave for soothing heat, or in the freezer for pain-relieving cold. The Vector is designed to be thin and low-profile so it can be worn discreetly under your clothes. Use the Vector to recover from a range of lower back problems such as lumbar pain, lumbago, strains and sprains, slipped discs, lumbosacral strains, spinal stenosis, spondylolisthesis, degenerative disc disease, and a herniated disc. The Vector's dual pulley system effortlessly provides vectored, targeted compression to the muscles and ligaments that need it most. This helps to relieve the pressure, tension, and pain felt throughout your lower back. To enhance recovery, the Vector's lumbar panel comes equipped with a therapeutic hot / cold gel pad. Place the gel pad in the microwave for soothing heat, or in the freezer for pain-relieving cold. 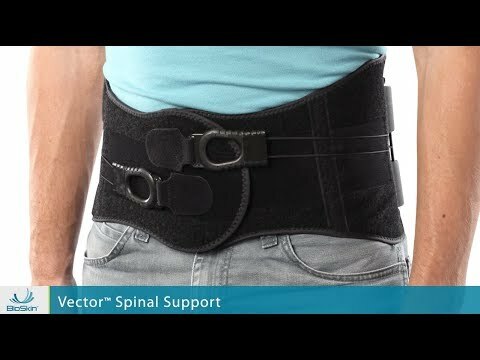 The Vector can be worn to improve posture and prevent back problems. Use the dual pulley-system to draw the lumbar panel forward into your low-back region. The brace will help you stand and sit more upright and take the tension off the lumbar muscles and ligaments. Position the hand pulls – Before putting on the Vector, ensure that both hand pulls are retracted all the way back on the side panels. This allows for better compression when you engage the cinching mechanism. Wrap the belt around your waist – With your right hand, hold the end with the black Velcro® hook. With your left hand, lay the left panel against your stomach, then press the right panel on top of the left. Belt should be snug, not tight. Apply compression – Grasp both of the hand pulls and pull forward while tightening your abdominal muscles. Press the hand pulls firmly against the belt to attach. The foam pad on the lumbar panel includes a pouch to hold the hot/cold gel pads. After heating or freezing a gel pad, insert it into the pouch and wear as directed above. TO HEAT: Place the gel pad flat in the microwave for 30-60 seconds. Heat until warm, not hot. Heat will discharge in 20-30 minutes. TO FREEZE: Place the gel pad flat in the freezer for at least an hour. Cold will discharge in 15-20 minutes.